Often, interfacing a controlled load to the meter can be a difficult and daunting task. Many times, the controllable loads’ current exceeds the meter manufacturers’ 100mA/120VAC specification of the KYZ switching device. Therefore, an interface or interposing relay must be used. The LCR-6D is a convenient and low-cost way to interface a higher current load to a low current output, improving isolation and enhancing electric meter reliability. The LCR-6D is an auxiliary load control relay designed specifically to retrofit into Cannon Emetcon receivers, making it fast and easy to change the receiver to interface with the meter’s dry contact output. Designed to safely interface a meter’s 2-wire dry-contact output to the Emetcon load management receiver, the LCR-6D provides a very low-current sense (wetting) voltage to the meter thus staying well within the manufacturer’s specifications. It may be used with meters having dry-contact outputs whether electro-mechanical, or high or low voltage semiconductor outputs. When the control signal is sensed, the LCR-6D’s relays’ are energized, closing the normally-open contact, or opening the normally-closed contact. 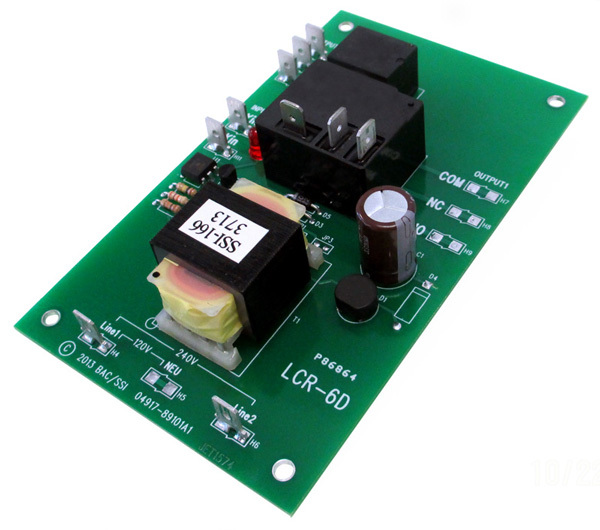 The LCR-6D includes two outputs, one high power 30 Amp, and the other low power 5 Amp. Both are Single Pole, Double throw outputs capable of switching up to 30 Amps or 5 amps respectively, over a voltage range up to 240VAC or 28VDC. The LCR-6D is a board level product and does not include an enclosure since it is intended to be mounted into the existing Cannon enclosure. Two mounting tabs are provided for line voltage, two for the dry-contact input, and three each for the relay outputs.